Size: 19 3/4 x 14 1/8. From the Theatrum Orbis Terrarum. Full title: Bvrgandiae Comitatvs Recentiss. Descriptio Dno Ferdinando Lannoyo auctore. 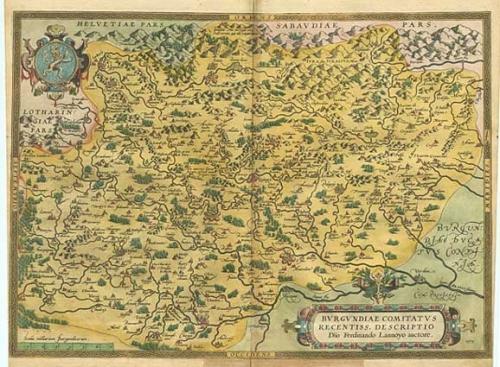 The map is oriented with the east at the top and depicts the Burgundy region of France. The side margins are cut tight and there is an old paper reinforcement on the recto of the bottom margin. Otherwise the map is in very good condition with bright colours. Latin text on verso.